In the celebratory spirit of the Islamic festival of Eid Al Fitr, Dubai Airport, Emirates Airline and Dubai Duty Free (DDF) recently welcomed their 50 millionth passenger to pass through the world’s largest airport terminal, Dubai International Emirates Terminal 3. Parvez Khan, an assistant manager with a hotel in Dubai and a resident of Ajman, was greeted at check-in by a delegation of Dubai aviation executives and presented with a certificate for 50,000 Skywards miles and Dubai Duty Free shopping vouchers worth AED 5,000 to mark the occasion. Parvez was accompanied by his wife Josephine and their 6 year old son Sahil. “This is just so exciting! It’s doubly surprising given the fact that I am seeing Terminal 3 for the very first time and it will also be my first time flying Emirates. The timing couldn’t have been better, as we are flying home to Mumbai for Eid,” said Parvez. Dubai Airport Emirates Terminal 3 first opened its doors in 2008 on 14th October for the exclusive use of Emirates Airlines. Since opening, Emirates Terminal 3 has handled more than 197,920 flight movements (Arrivals & Departures), 50 million passengers and some 70 million pieces of luggage. Terminal 3 at Dubai Airport is the world’s largest and its unique design coupled with state-of-the-art people transportation solutions such as travelators greatly shorten the distance from kerbside to the aircraft. There are currently around 85,000 passengers that pass through Dubai Airport’s Terminal 3 building every single day, and that number continues to grow. The impressive traffic growth at Dubai International is expected to continue with annual passenger numbers set to exceed 46 million during 2010, up 13.6 % from the 40.9 million recorded last year. Dubai Airports’ long term forecast projects passenger numbers will top 98 million by 2020. To help accommodate the anticipated traffic growth, the construction of Concourse 3, set to become the world’s first dedicated A 380 facility, is under way. Concourse 3 at Dubai Airport is scheduled to open towards the end of 2012. Dubai Airports owns and manages the operation and development of both of Dubai’s airports, Dubai International as well as the recently opened Dubai World Central — Al Maktoum International. 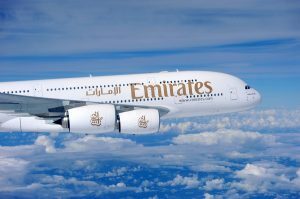 Dubai International is the 6th largest airport in the world in terms of international passenger traffic volumes and 6th in international cargo volumes offering connections to over 220 destinations across 6 continents on more than 130 airlines. Interesting facts on Dubai Airports Emirates Terminal 3 building..
Excavation of over 10 million cubic metres of earth, enough to fill 4,000 Olympic-size swimming pools. As much as 450,000 tonnes of steel was used for reinforcement and another 33,000 tonnes of steel was required for the structure. That’s approximately the weight of 850 Airbus A380s.